First up, Violet Tendencies brings the third event under the banner Valkyrie Productions to the Columbia City Theater Friday and Saturday, April 19-20. For Love & Money will flirt with a little multimedia action for the first time as the performers bring acts that “sell” versus acts that fall more into subversive territory. The contrast of high glamor showmanship with more animal impulses might reveal a duality in some performers we’ve come to know in a more “marketable” light. Lola Frost & Cherry On Top of the Vancouver Burlesque Centre will guest star. For tickets, click HERE or check out the Facebook event HERE. Want a little peek behind the curtain? Speaking of Paris Original and The Luminous Pariah, they’ll soon represent Seattle’s thriving boylesque scene at the 2nd Annual New York Boylesque Festival. Fortuitously (but not surprising at all, given their stupendous talent) Waxie Moon and Trojan Original have also been accepted to the fest. It’s an incredible honor that the unique talents of these performers will not only be recognized- but will be recognized together. We couldn’t be more proud, and the four couldn’t be more delighted to make the journey together and support one another on their Big Apple adventure. Give our hometown boylesquers a proper send-off Sunday April 21 at The Rendezvous as they prepare to embark on their journey to the world’s only boylesque festival. The event will showcase the acts to be performed in New York- now’s your chance to say you saw them before they were famous. Bite the Big Apple is a performance showcase and fundraiser featuring a raffle and live auction. Proceeds will help to offset the performers’ travel costs. Help our Seattle boys turn it OUT in NYC! Featuring Waxie Moon, The Luminous Pariah, Paris Original, Trojan Original (Hosted by Leeni). April 21 @ 7:30pm, The Rendezvous. Get tickets HERE. 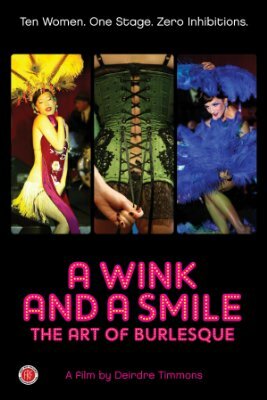 Finally, next Wednesday April 24 at West Hall there will be a special screening of the film A Wink and A Smile hosted by Miss Indigo Blue, filmmaker Deirdre Timmons, and special guests. Catch a glimpse of early Academy of Burlesque history among friends and familiar faces at West Hall. Doors open at 6:30, the film will begin at 7. $10 suggested donation. ~ by angrytruffle on 04/17/2013.